Before & After photos are some of our favorite moments! Below are some examples of Dr. Metz’s work. When you come in for a complimentary consultation, Dr. Metz will explain the outcomes you can expect for your unique case. In addition, we are the only orthodontic practice in the area to offer the iTero® scanner, a technological advantage that allows for a quick and comfortable scan of your mouth. The iTero Outcome Simulator will help visualize how your teeth may look at the end of treatment. This patient had upper and lower crowding and asymmetric midlines. 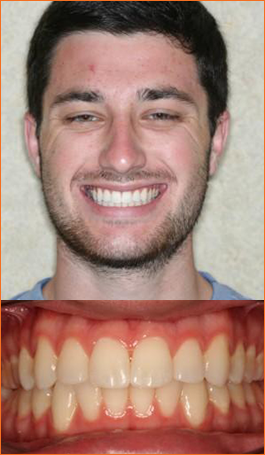 The dental midline is the line between your two upper front teeth and your two lower front teeth. They should align with the center of the nose and the midpoint between your eyes. When they are off, your bite may not fit right or match correctly. 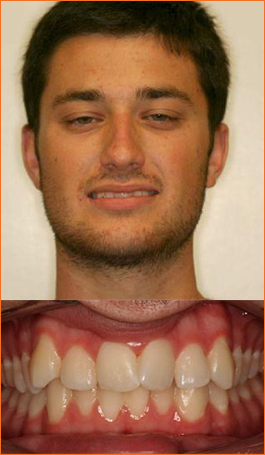 The patient did not feel confident when he smiled. Through careful planning, one tooth was selected for removal. The remaining teeth were shifted into place to facilitate the matching midlines and proper bite. Good bite, all teeth in alignment and midlines match. Cannot tell a tooth is missing. 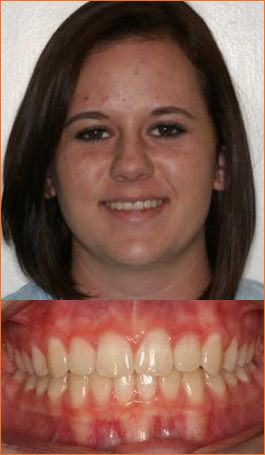 Patient is happy with outcome and proud to smile. 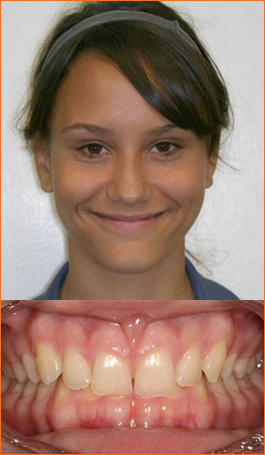 Patient had a slight cross bite, and an upper left side tooth behind other teeth, giving a disproportioned smile. Canines were slightly protruding. 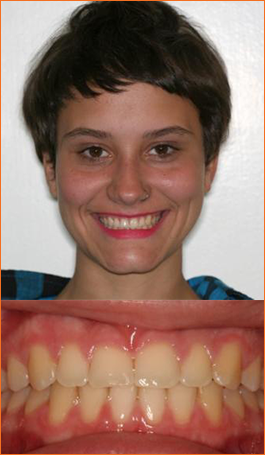 Midline was off – notice space between upper teeth is centered over a lower tooth. 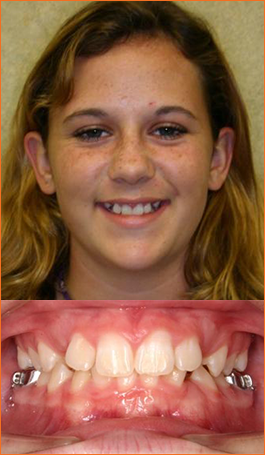 Braces were used to correct crowding and improve alignment. All teeth aligned, bite and midline improved. Entered treatment at age 9. Patient had crowding with no room for adult canines to come in. 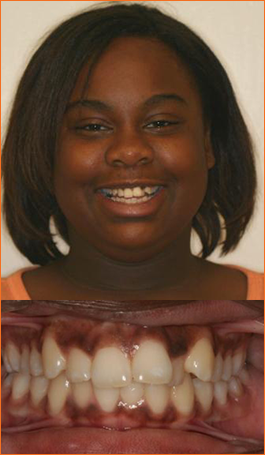 This patient had two-phase orthodontic treatment. During Phase One, space was made to allow for the upper canines to come in, and the patient wore a retainer while we waited for the teeth to come in. Once the teeth erupted, Phase began. Braces were used with brackets on all teeth including the newly-erupted canines, to guide them down into proper position. Problem of impacted canines was avoided in Phase One, and after Phase Two, patient has well-positioned adult teeth. Patient had a very deep vertical overbite. The upper front teeth completely covered the lower teeth. In addition, there was a space between front teeth. 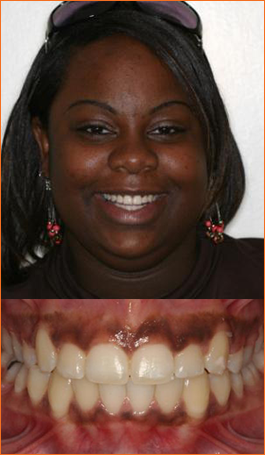 She did not like her smile – didn’t even want to show her teeth when we photographed her at the start of treatment. Braces and rubber bands were used to lessen the deep overbite and give the appropriate amount of tooth show. Patient has appropriate amount of tooth show. Braces closed the space between upper front teeth.